December 19, 2011 – Providence, Rhode Island… The Rhode Island Public Transit Authority (RIPTA) announced changes to its organizational structure following a meeting of the Board of Directors today. Citing budgetary shortfalls, RIPTA announced that approximately thirty (30+) non-transportation positions will be eliminated effective in early 2012. However, RIPTA CEO Charles Odimgbe stated that service needs will necessitate hiring more than twenty (20) drivers by April 2012 to meet ridership demands. Established in 1966, RIPTA is a quasi-public; independent organization governed by an eight member appointed Board of Directors and is authorized to operate public transit services throughout the State of Rhode Island. RIPTA employs over 800 individuals, and operates 3,300 daily trips on 54 statewide fixed bus routes. RIPTA’s approved Operating Budget for Fiscal Year 2011 was $100.3 million. Currently, RIPTA faces a $4.6 million budget deficit. A contributing factor cited by Mr. Odimgbe is the need to address certain operational inefficiencies that remain unresolved after lengthy discussions with labor representatives. RIPTA released its Five Year Strategic Plan this past March to “Keep Rhode Island Moving,” which commits to maintaining a strong bus system and improving the passenger experience for its riders. Do we really need a streetcar when RIPTA has to fire people to make ends meet? It will be 3 or 4 years before a streetcar is operational, if it gets built on schedule. The funding for it would not help with RIPTA’s current or future operational shortfalls. The federal government does not allow capital funding, such as would be needed to build the streetcar, to be used for operations. Streetcars or light-rail historically trigger high levels of development. Buses don’t. 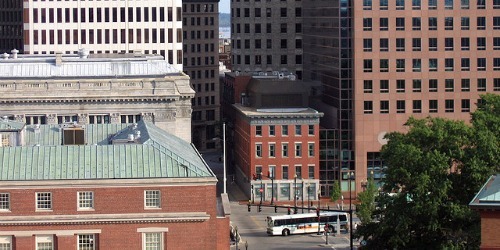 The now greater Downtown area desperately needs an internal transit system (or core connector), such as the streetcar to remain competitive with other cities. Whether streetcar or bus, the costs to operate a core connector would be the same (staffing salaries). RIPTA’s current budget shortfall is due to an outdated funding system|the gas tax. The only solution is for the General Assembly to change how RIPTA is funded. The streetcar really has nothing to do with the current budget problem.